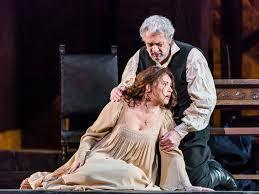 This is the one opera I simply MUST see again Wednesday evening for the replay. Alongside "Ballo," my favorite non-mainstream Verdi opera. As a bass, I'm obviously a fan of the bass/bass duet. I thought, except for Domingo, the singing was quite excellent throughout. The fact he bailed out TWICE on verses in his first act cabaletta was lame. Yes, he has good stage presence and interacted well with Yoncheva, but he needs to give real baritones a chance to get their careers moving. I noticed in the bows that there appeared to be 3 different prompter boxes. Curious. I admit that the bits I heard on the radio did not show PD at his best.